It's not possible to give all new Air Force recruits the AFSC (job) they want, even if they're qualified. Each Air Force job has an assigned "manning level," which is broken down by rank. In other words, the Air Force constantly determines (for each job) how many first-termers they need (Airman Basic through Senior Airman), how many Staff Sergeants the job needs, how many Technical Sergeants the job needs, and how many Master Sergeants the job needs. At least once per year, the Air Force studies the manning-levels of each AFSC, and rates each AFSC (by rank) as "shortage," meaning there are not enough individuals doing that job in that rank, "average," which means the manning level for that job/rank is just right, and "overage," which means there are too many people in that rank doing that job. If the manning level for the first-term ranks (Airman Basic to Senior Airman) is projected to be "shortage," they issue "requirements" to the Air Education & Training Command (AETC), who in turns tries to make sure there are enough training seats, and, in turn, issues "slots" to the Air Force Recruiting Service. Job requirements for NCOs (those on their second or subsequent enlistment) are released for possible NCO voluntary and involuntary re-training (more on that, later). Even if an Air Force job is listed as a "chronic shortage job," that doesn't necessarily mean the job will be open to a new recruit, even if qualified. Such factors as available training seats come into play. Or, the job may be "shortage" overall (because it has a shortage of NCOs,) but may be adequately-manned when it comes to the first-termer ranks. Additionally, some Air Force enlisted jobs simply aren't available to first-term enlistees. A couple of examples would be Equal Opportunity, or Education and Training, or Office of Special Investigations (OSI). Air Force recruiters traditionally address these concerns by informing applicants who don't get one of their primary job choices that re-training is possible after a few years of service. Enter the Air Force Re-Training Program. The regulation which governs retraining for Air Force enlisted personnel is Air Force Instruction 36-2626 — AIRMAN RETRAINING PROGRAM. The Air Force Enlisted Retraining program can be divided into three major areas: voluntary re-training for first-term airmen who have (almost) completed their first enlistment period, called CAREERS, (which stands for "Career Airman Reenlistment Reservation System"), NCO retraining (which applies to those on their second and subsequent enlistment period), and disqualified airman retraining (which applies to both first-termers and those on subsequent enlistments). A first-term airman (four-year enlistment contract) assigned to a CONUS (stateside) base is eligible to volunteer to retrain after they have completed 35 months (no more than 43 months) of military service. A six-year enlistee (assigned to CONUS) may volunteer to re-train after completing 59 months of military service. For first-termers assigned to overseas bases, they may put their application in between the 15th and 9th month before their DEROS (Date Eligible to Return from Overseas Station), as long as they will have at least 35 months (four year enlistee) or 59 months (six-year enlistee) of service, at the time they depart the overseas station (in this way, approved applicants can be re-trained, en-route, before they report to their new duty station). The only exception to the above requirements is for those volunteering to retrain into the Pararescue, Combat Controller career fields. Such individuals may apply for retraining after 33 months of service (four-year enlistee) or 57 months of service (six-year enlistee). 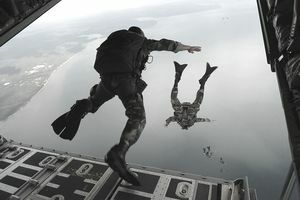 This allows time for the individual to complete the Pararescue PAST, or Combat Controller PAST, and required medical exams to include as part of their re-training application. As an "exception to policy," volunteers for Pararescue, Combat Controller, SERE Instructor, any aircrew AFSC, and any linguist AFSC, may submit re-training applications after 24 months of service (four-year enlistee) or 36 months of service (six-year enlistee). Those who are serving in the following jobs can volunteer to re-train into a "lateral specialty" after serving for 24 months (four-year enlistee) or 36 months (six-year enlistee): Security Forces, Physical Medicine, Aerospace Medical Services, Surgical Services, Diagnostic Imaging, and Optometry. For example, a 3P0X1 - Security Forces troop could volunteer to re-train into 3P0X1A (Dog Handler) or 3P0X1B (Firing Range Instructor), after completing 24 months of service (four-year enlistee) or 36 months of service (six-year enlistee). Unlike the NCO retraining program, first-termers do not have to serve in a career field which is considered to be overmanned to re-train. However, if they want to re-train into a career field which is projected (for their rank) to be "average" or "overage," approval to retrain is not likely to happen. Remember, the Air Force's goal is to try and "balance" career-field manning for each rank. Retraining applicants are "encouraged" to list at least three re-training choices. Retraining applicants must meet the qualification standards for the AFSC they wish to re-train into (ASVAB Score, medical profile, security clearance, etc.). Applicants who don't meet the ASVAB score requirements can take the Armed Forces Classification Test (which is the same test as the ASVAB, just a different name) to try and achieve a qualifying score. Warning, however, if one elects to do this, for retraining purposes, the latest score is the one that counts, not the highest score. So, if one takes the AFCT, and scores lower, one's re-training qualifications will be based on the AFCT, not the original ASVAB test they took when they first joined. To volunteer for retraining, applicants must be eligible and recommended (by their commander) for re-enlistment. Additionally, if their most recent EPR (Enlisted Performance Report) is rated less than a "3," they are ineligible for voluntary re-training. If the report is a "referral" (i.e., contains certain derogatory statements), the individual is ineligible. Finally, the individual must be recommended (by their commander) for re-training. Commanders must sign the following statement on the individual's retraining application: "Individual’s attitude, behavior, and record indicate a probability of success for retraining. There are no quality factors that preclude this individual from retraining. As a rule, individuals who have received an enlistment bonus for their AFSC, cannot re-train until they have served the entire enlistment period for which their enlistment bonus was based. If they are re-training into an AFSC which has a re-enlistment bonus, this can be waived, but any "unearned" portion of the enlistment bonus will be deducted from any re-enlistment bonus received for the new AFSC. Individuals who are approved for re-training must extend their enlistments for a period of 23 months past their original date of separation. Additionally, they must have at least 14 months of service remaining, following the re-training program. Retraining applicants need to understand that applying for an Air Force shortage skill does not mean automatic approval. If retraining applications exceed the number of retraining quotas, the Air Force will disapprove the application. Career Job Reservations. First-Term airmen who wish to re-enlist may have no choice, other than to volunteer to re-train. First-termers serving in jobs which are projected to have "overage," must apply for a Career Job Reservation or CJR. This means that the Air Force is going to strictly control the number of first-termers allowed to re-enlist in this job. Individuals put in a request for a CJR, and hope their name gets to the top of the list before their discharge date. If their CJR doesn't come up, and they haven't applied for re-training at least 120 days before separation, they will be forced to separate. Applying for re-training does not cancel a CJR request. So, if an airman applies for a CJR in their original career field, and applies for re-training, they can cancel their re-training request if they receive a re-enlistment slot in their original job. The annual NCO Retraining Program (NCORP) is designed to move Noncommissioned Officers (NCOs) from AFSCs with significant overages into AFSCs with NCO shortages. This program consists of three phases: The first two phases are voluntary, and the third phase is involuntary. Retraining objectives are determined by the Air Staff. Phase II. If sufficient applications are not received during phase I, the Air Force implements phase II. This phase is a voluntary phase; however, all eligible airmen who are vulnerable to involuntary retraining are formally notified and encouraged to apply. In other words, the Air Force sends out individual notifications, telling them this is their last chance to volunteer to retrain into a (shortage) career field of their choice. Otherwise, if enough volunteers aren't received, the individual may be selected for involuntary re-training, and they won't get to choose their new AFSC. In either case (Phase I or II), Retraining applicants need to understand that applying for an Air Force shortage skill does not mean automatic approval. If retraining applications exceed the number of retraining quotas, the Air Force will disapprove the application. Phase III. If retraining objectives for the fiscal year are not met through the voluntary phases, the Air Force will implement selective retraining (involuntary). Airmen who possess a secondary or additional AFSC in a shortage skill are returned to those skills if in the best interest of the Air Force. If skill imbalances still occur, the Air Staff will direct involuntary retraining into selected AFSC shortages. If individuals are selected for involuntary re-training, and they refuse to gain the service-retainability needed in order to re-train, they are projected for discharge on their current projected date of separation. As with the first-termer program, those who retrain must meet the qualification standards for the AFSC they wish to re-train into (ASVAB Score, medical profile, security clearance, etc.). Applicants who don't meet the ASVAB score requirements can take the Armed Forces Classification Test (which is the same test as the ASVAB, just a different name) to try and achieve a qualifying score. Warning, however, if one elects to do this, for retraining purposes, the LATEST score is the one that counts, not the highest score. So, if one takes the AFCT, and scores lower, one's re-training qualifications will be based on the AFCT, not the original ASVAB test they took when they first joined. In order to be eligible for retraining, applicants must be eligible and recommended (by their commander) for re-enlistment. Additionally, if their most recent EPR (Enlisted Performance Report) is rated less than a "3," they are ineligible for voluntary re-training. If the report is a "referral" (ie, contains certain derogatory statements), the individual is ineligible. Finally, the individual must be recommended (by their commander) for re-training. Commanders must sign the following statement on the individual's retraining application: "Individual’s attitude, behavior, and record indicate a probability of success for retraining. There are no quality factors that preclude this individual from retraining. Each Air Force Training Program has an established CDA (Controlled Duty Assignment) period. The length of the CDA depends on how long the training program is. For example, the Air Force has established a CDA of three years of linguist training. NCOs considered for retraining must have, or be able to obtain (extension, re-enlistment, etc. ), enough time on their enlistment to have at least 14 months of service retainability following the training, or the CDA (whichever is greater). High Year of Tenure (HYT) limits apply. Air Force enlisted personnel who are disqualified from their current AFSC, or disqualified during a training program are placed into one or two categories — disqualified for cause, or disqualified for reasons beyond their control. Air Force policy is to retain and retrain only those airmen who have demonstrated the ability to successfully complete training and whose past record clearly justifies further investment. Disqualified for Cause. Airmen are categorized as disqualified for cause when they no longer meet the requirements for any of their awarded AFSCs (or the training school), and the basis for withdrawing the AFSC (or failure in training) is for conditions or actions over which the airman had control. Examples of disqualification for cause include loss of security clearance due to misconduct, drug or alcohol involvement, failure to progress in training (for reasons within their control), substandard duty performance or other acts that lead to AFSC withdrawal or training school failure. For those in training status, the technical training squadron commander recommends separation or administrative action for airmen eliminated for reasons within their control. Retrainees who are removed from training for misconduct are not considered for retraining. In such cases, the commander returns the airman to the losing organization for action (for re-trainees) or processes discharge action (for those in PCS training status). The technical training squadron commander considers all circumstances surrounding the individual’s elimination to determine if separation is appropriate. If the commander does not initiate separation, the airman reports for retraining. When the commander recommends further retraining or returning airmen back to a previously awarded skill, the commander will indicate why separation was not warranted. In such cases (airmen eliminated from training for cause), if retention/re-training is approved, the individual does not get a choice in which fields they will be re-trained into. If selected for re-training, airmen are re-trained into an AFSC that they (1) are qualified for, (2) has an available class-start date within 120 days, and (3) has a course-length of no longer than 8 weeks (40 academic days). No retraining action is required for first-term airmen within 10 months of DOS or second term/career airmen within 18 months of High Year of Tenure (HYT). The commander will utilize those airmen locally at his discretion. Disqualified Not For Cause. Airmen are categorized as disqualified not for cause who no longer meet the specialty qualifications for any of their awarded AFSCs, and the basis for withdrawing AFSC is for conditions or actions over which the airman had no control. Examples include medical conditions such as hearing loss, toxic chemical exposure, injury resulting in AFSC withdrawal, or failure to progress in training for reasons beyond the airman’s control. Airmen disqualified not for cause may apply for separation under miscellaneous reasons in lieu of retraining. Airmen must apply for AFSCs for which they meet all requirements and have a class starting within 120 days. Airmen are encouraged to list, as a minimum, three AFSC choices. If the Air Force cannot approve the choices, the Air Force will provide retraining AFSCs based on Air Force requirements and the individual's qualifications. Airmen between the 24th and 38th month of service for a 4-year enlistee (48th and 62nd for a 6-year enlistee) will apply using their CAREERS option, provided the airman is recommended for reenlistment. Airmen eliminated from technical training courses for academic deficiency (not within their control) may not request retraining into AFSCs that require an identical or higher aptitude score.